Well... What a day! The weather was beautiful, but the hills were formidable. We walked (pushed) our bikes up part of two hills, Devils Slide and Skyline Drive. Their names say it all. The views were fantastic! That made all the hard work worth it. We took a break at Ocean Beach and Dave struck up a conversation with a local bike rider (also named Dave, a professional musician)who was the nicest, kindest fellow. We enquired about the route, he looked at our maps, and said that we didn't want to go that way. Dave said follow me, and lead us (at loaded touring bike speed even though he was on a racing thoroughbred) to Crissy Field by the most gentle and scenic route through Golden Gate Park and the Presidio. It was one of those random acts of kindness that seem to happen to touring bicyclists and Dave will always be remembered fondly. 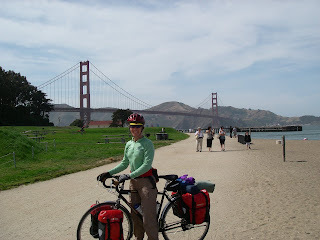 We traversed the beautiful environs from Crissy Field to our hotel near Fisherman's wharf and checked in. Then came the challenge of getting two bikes, the trailer and Jack into a second floor room via elevator. We were lucky that the the elevator could accomodate a fully loaded touring bike and it only took four trips to get settled in our room. At the complimentary wine and beer happy hour Jack wanted to meet everyone. He was admired by quite a few of our fellow guests who knew and appreciated Jack Russell Terriers. Onto Sacramento, our next major destination via ferry to Vallejo.